Have you ever downloaded an image from the internet to use in your presentation? Or perhaps, re-posted the image in your personal social media account, or used it as a cover picture for a blog post? Myth: If it’s online, it’s free. Many people think that anything that can be found on the internet is free for use. Intellectual property lawyers, however, would quickly tell you that this is not true, as many images online are actually protected by copyright. In fact, unless you are confident otherwise, you would be advised to assume that there are legal restrictions on the use of images, such as copyright. Read on if you want to know some of the legal considerations in using images that you find on the internet without infringing copyright. First, to help understand how to avoid infringing copyright, you need to understand what copyright is. Essentially, copyright is the right to prevent someone else from copying, using or distributing original work that you have created. Works that can be protected by copyright include novels, plays, musical compositions, paintings, sculptures, sound recordings, films, and of course, images and video. Copyright law is meant to encourage more people to create new works, by giving them the assurance that their work and intellectual effort will be protected so that they have a monopoly over their work that they can profit from for a fixed period of time (the “term”). How does copyright come about? Copyright comes about immediately once a work has been created in a tangible form of which it is capable of being reproduced. It is automatic – the creator of a piece of work does not need to go through any formalities or applications to obtain copyright over the work. The duration of the copyright depends on the type of work. Generally, in Singapore, for literary, dramatic, musical or artistic works, copyright lasts for the lifetime of the creator and another 70 years after the creator’s death. Sometimes, if the work is not released to the public before the death of the creator, then the copyright lasts for 70 years after the work is released to the public. For photographs, specifically, copyright lasts for 70 years after a photograph is first published. Therefore, if you are using images that are very old works, say those published before 1900, it is likely that the copyright on the work has expired. Such works – where the copyright has expired – are said to be in the public domain. This means that they are not protected by copyright and are free for use by anyone. In such cases, copyright infringement is less of a concern. Of course, given the exponential ease in content creation over the last few decades, including with widespread camera phone penetration, there are a lot more images protected by copyright, than not. Most of the time, the creator of the work will own the copyright. However, in certain scenarios, the copyright may be owned by someone else. One case is where the creator may transfer – or “assign” – the copyright to another person, who will then own the copyright. Another case is where the creator may have created the work in the course of his employment, in which case the copyright will be owned by his/her employer. Finally, if the work is a painting or photograph of another person who has engaged – or “commissioned” – the creator to paint or photograph him, then the person is the copyright owner, rather than the creator himself/herself. Generally, an infringement of copyright occurs where someone reproduces, sells or distributes the whole or a substantial part of another person’s copyrighted work without the copyright owner’s permission. Infringement of copyright can have both civil or criminal penalties. In Singapore, criminal copyright infringement, typically for activities involving piracy or commercial distribution, can attract a fine of up to $100,000, and/or up to 5 years’ imprisonment. Even if the infringement of copyright is not an offence, the copyright owner can still seek a civil remedy against the infringer. For example, she may ask the Court to make orders to prevent future infringement. The Court may also order the infringer to pay the copyright owner a sum of money as “damages” (to cover the losses suffered by the copyright owner) or an “account of profits” (to give to the copyright owner the amount of money earned by the infringer through his infringement). Sometimes these damages are tied to the cost of having obtained a proper licence, if such prices are available. Typically, damages and legal fees for dealing with accusations of infringement far exceed the cost of getting a proper licence in advance. How do I avoid infringing copyright? 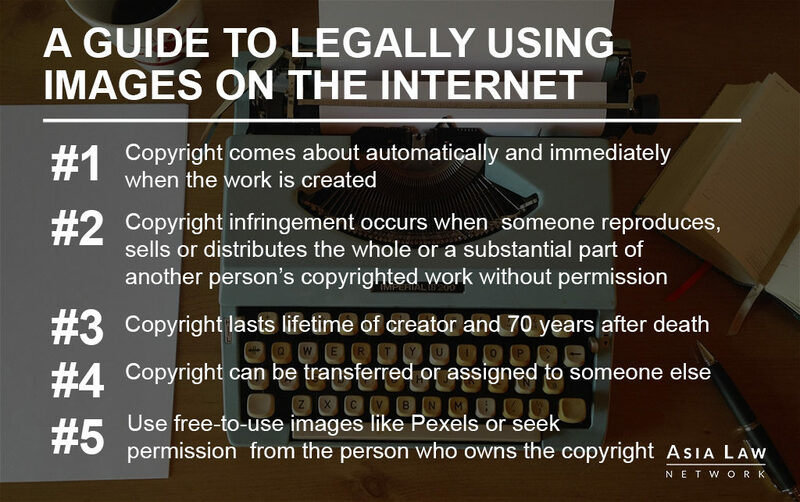 Now you know what copyright is, here is a tip on sourcing for images online in order to reduce the risk of infringement. The most direct way of avoiding copyright infringement is asking the copyright owner for permission to use his/her work. Unless you are sure that the work is in the public domain, for example, if it is expressly described as such, it is always safer to attempt to find the original creator and ask for his/her permission before using the image. Remember to build in some time for a response and even possibly some negotiation, as well as the possibility that the owner may not agree, or may even not respond. It may take weeks and/or it may cost more than you want to pay. If you cannot afford to wait for or pay a proper licence, consider finding alternatives up front in case it doesn’t work out. Do not use the image first and ask for permission subsequently; your bargaining power is severely reduced and you may already be legally liable. How do I find the copyright owner? Assuming the image’s owner is not clearly identified, here is where some detective work may be needed. Sometimes you may find the owner’s name or details on or with the image (such as in a copyright notice (look for a © copyright symbol, or a copyright notice, e.g. “Copyright XYZ 1999”, or something like “@ownersInstagramHandle”, to start your enquiry with internet search engines. You could also use the image itself via online search engines. These search engines help you to search for similar or identical images online. From the search results, you may then be able to find the original source of the image, which will likely link you to the copyright owner. Useful search engines like these include TinEye, or even Google Images’ search by image function. What should I ask the copyright owner? Where you intend to use the image – do you intend the image to appear online, or a poster, or some other medium? What you are using the image for – for example, is it for educational, non-commercial purposes, academic or personal purposes? How you intend to use the image – will you be editing the images, will it be used as one part of a bigger piece of work? It may be helpful to include a sample of the intended use of the image to give the copyright owner a clearer idea of what you have in mind. How the copyright owner would like to be credited, should he/she give you permission to use his/her work? Any other terms of a licence, including if there is a licence fee. changed their copyright through alternative image licenses, which permits other people to use the work under certain conditions. What are alternative image licenses? The most common alternative image license is the Creative Commons (CC) set of licenses. This set of licenses covers various permutations of conditions and circumstances under which an image can be used. For example, there could be a “CC BY” license to share the work, which means that other people can only copy, distribute and transmit the work, as long as attribution is given. Other CC licenses may have other conditions, such that requiring that the image not be used commercially (eg “CC-NC”). If an image has a CC license, it may be free for use in certain circumstances. Another alternative image license is the GNU Public License (GPL). This license is most often used to license software so may not be ideal for images, but it does allow the most flexibility on alteration, provided the work is then published on the same terms and with a copy of the GPL available – do note that these may not work for everyone. There is a range of stock image sites that offer a wide range of options, ranging from royalty-free to those with nominal fees. Do read the terms of the sites carefully as they can be quite specific with conditions. Some examples of such sites are: Canva, Pexels, Unsplash, Gratisography and Morguefile. You can also use search engines and other resources to find free-to-use images. Google Images: This works like an ordinary search for images, but with modified search terms. After making a search, you should click “Search tools”, and then select the appropriate license that you are looking for under “Usage rights”. This will allow you to narrow your search to those images that have those specific usage rights. Creative Commons (“CC”): This is not a search engine per se, but allows you to access various search engines provided by other independent organisations such as Flickr and Google Images. You can also select particular conditions for use, for example, indicate that you want images to use for commercial purposes or images that you are free to modify yourself. Wikimedia Commons: This is a collection of free usable media files, which are either in the public domain or freely-licensed. This means that anyone can contribute to the collection, and anyone can use materials from the collection for free. Most of the files in here are published under CC licenses. Flickr: This works similar to Google Images, in that it functions as a search engine for free to use images. Using Flickr’s Advanced Search, you can modify the search times to search only for images with CC licenses. You may also further narrow it to particular conditions of use, for example, for commercial use or modification. After finding a free-to-use image from these search engines and databases, you should still check the image’s license, to ensure that it is indeed under a license that allows you to use it as you wish. If you do use the image, and even if they do not specify it, consider at least acknowledging the creative effort of others and crediting the original source, even if it is a free-to-use image. While some people will always take a risk and use an image no matter what, there is one final option for the more cavalier. You can take a risk under the argument that there is no infringement, as the use of the image falls under any of the fair dealing exceptions in the Copyright Act. Fair dealing is a doctrine that prevents certain uses from constituting copyright infringements. This doctrine was introduced in Singapore in 2004 based on the American “fair use” approach and intended to balance between the interest of copyright owners in protecting their copyrights, and the interest of users who benefit from a free exchange of information and ideas, and who themselves wish to develop creative works. Fair dealing only comes into play after someone claims that your use of the image is copyright infringement. In such cases, the court will then have to decide whether your use of the image was fair dealing or copyright infringement. How do I know whether something constitutes fair dealing? Please note that fair dealing in Singapore is NOT interchangeable with fair use in the US. The purpose and character of the use of the work – for example, was it of a commercial nature, was the use for non-profit or educational purposes? Additionally, the Copyright Act also expressly states in specific cases, some uses may be fair dealing. For example, uses for the purpose of criticism or review may be fair dealing where sufficient acknowledge of the original work was made. Similarly, uses for the purposes of reporting of current events may also be fair dealing. However, because it is still subject to the decision of the Court, there will always be an element of uncertainty whether you are infringing copyright. You will not know whether your use of the image constitutes fair dealing until after you have used the image and a claim has been made against you in Court, by which time you are likely to have incurred legal costs and possible liability. Unless you are fairly confident of falling within an exception, or have a lawyer’s express advice on hand, this is somewhat a riskier – and hence rare – approach. Question 1: What do I do if I am unable to find the original copyright owner, even after conducting the various searches? Can I just go ahead? It is your choice if you want to go ahead and use the image after a risk assessment. Unless you are confident that the work is in the public domain or that you have a legal defence or excuse, using the work without the owner’s permission is still a risk that could have expensive consequences and taint your reputation. Is that image really that critical to your project? Are there no alternatives? Question 2: If other people are using the image without crediting or attributing the copyright owner, does that mean I can use it too? From a legal perspective, if each of these people is infringing copyright, each of them is still liable to the owner, who can, of course, sue every single one of them. Credit or attribution does not negate infringement, though it does help address the separate issue of plagiarism. Question 3: Is it still copyright infringement if I only use a small part of the image? The test is whether “a substantial part” of the copyrighted work is copied. This is a question to be decided on the particular facts of each use, and there is no magical “X%” number. As a suggestion, if something is immediately recognizable as being “from” the original artistic expression of the copyrighted work, that is an indicator of elevated risk. Question 4: If I take a picture of an original work, does my picture then have its own copyright? To the extent that the new picture is itself an “original” artistic expression, yes, it could have its own new, independent, copyright. However, that new picture would also be subject to the pre-existing rights of the earlier work and author. Question 5: Can I use a screengrab from a popular movie? As with many answers from a lawyer, “it depends”. You might end up in front of a judge to defend your use. Some users may argue some scenes are not important to that movie (a “de minimus” or minimal excerpt). Other scenes, on the other hand, may be so distinctive or iconic that using them would feel like “taking” something original that would attract a lawsuit. At the same time, it also depends on your intended use: were you simply using the image as incidental clip art, or were you using the image to illustrate a review of the movie, which might fall under the fair dealing exception? Will it affect the owner’s ability to exploit that work? Are you a small personal fan blog with 100 fans, or are you a production house that is charging for the work that includes the screen grab? Have a question on copyright? If you need legal advice on copyright matters, you may get a Quick Consult with one of our practicing lawyers for a transparent and affordable fee of $49 and expect a call back within 1-2 days to get your questions answered. Alternatively, you can request a quote with Adrian Kwong. 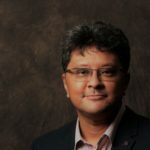 This article is written by Adrian Kwong from Consigclear LLC and edited by Leanne Cheng from Asia Law Network.